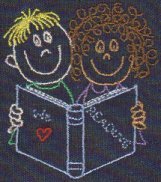 Fabric book covers are so much more durable for all those school books the children have to take care of. Why not embroider them? They are quick and easy to do. I particularly love to use denim and featherwale corduroy. Piece of cake! If you like, you can even embroider the child's name and teacher on the inside of the front facing (before you stitch the facings, of course!). Appliqué pockets are also fun on the front of the book cover. Have fun finding designs to go with the subject of the book. There are tons of them around! Here's a free one to get you started!